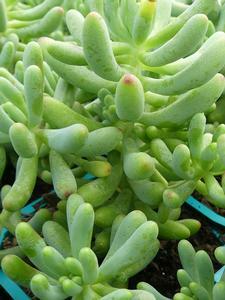 Produces bunches of fleshy, grape-like green-grey leaves. The yellow flowers are borne in winter. Ideal in rockeries, banks and sunny courtyards. Plant in full sun/part shade in well-drained soil. Leaves change from green to red in summer. An excellent plant for containers and grows up to a height of 25cm. Drought tolerant. Before planting cultivate the soil to a depth of 20cm and mix in compost and a complete garden fertiliser. Use Oderings Potting & Basket Mix for containers. Grows best in a well drained area in full sun.